RESERVE YOUR SPOT! All other days are FREE! Bring your bargain shopping friends, and don't forget Grandma, to this savings extravaganza! We gladly accept cash, debit cards, Visa®, Mastercard® and Discover® credit cards for payment. -- Volunteer and shop FIRST! 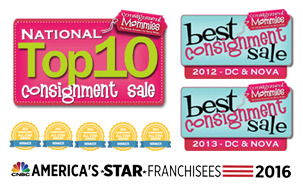 -- Consign and make some MONEY! Volunteering was fun and there was a great selection for shopping! The quick reporting on what has sold. Love the intra-day reporting.